Like literary fiction best? You may be a marketer at heart! Thanks to all the fearless story champions who took part in 2A’s Give a Book campaign, we donated 1,000 books to kids and gathered a few interesting nuggets about how stories shape our communities along the way. Wondering if you’re more likely to be surrounded by Cats in Hats or Big Friendly Giants in any one part of the city? Read on to find out! Through our work with Page Ahead Children’s Literacy Program to promote their annual luncheon, we learned there are tens of thousands of students in Washington state who live in low-literacy, low-income families and neighborhoods without access to books. The good news is that the simple act of giving new books to these children can help them learn to see themselves as readers and trigger lifelong learning. To help raise awareness among our local communities, 2A donated the cost of one book to Page Ahead for every participant who completed a survey. Six questions, one book, and a potentially brighter future. Who could say no? Remember Goodnight Moon, Where the Wild Things Are, and The Giving Tree? Those were the three most popular stories. 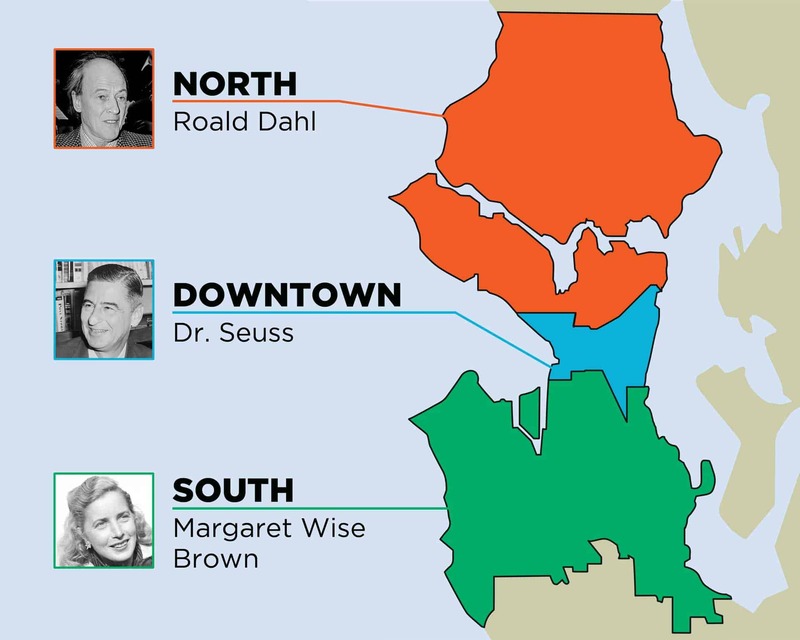 Many of our story champions who live north of Seattle today grew up reading Roald Dahl, downtowners read a lot of Dr. Seuss, while those south of Seattle preferred Margaret Brown Wise (think Goodnight Moon). Over 70% of our story champions read fiction as adults: marketers tend to prefer literary fiction, while developers reach for sci-fi. Storytelling helps me visualize abstract thoughts. It influences my creative and imaginative side! It is a part of knowing where you come from. Storytelling provides a common thread out of uncommon topics. It opens a window to the world. It is the essence of all collaborative action. Storytelling provides alternative role models and voices. Page Ahead, we tip our cat-in-hat to you for recognizing, not only the importance of books in the home, but the power of storytelling to help children visualize themselves as successful readers. And a special thanks to all those who supported our Give a Book campaign! Did you miss the drive, but still want to get involved? It’s never too late to give a book!